And so the years draws to a close. We all survived, perhaps even thrived or barely slid by, succeeded, conceded, settled, forged on, accepted, rejected, cried, laughed, hoped and prayed in times of desperation and in times of celebration - and without ever setting eyes on any of you - or any of you upon me - we shared in all of this together. Amazing. our hearts are intimate, known and vulnerable to one another and I feel so very close to all of you. I feel so blessed to take all of you with me in to 2011 and that you have allowed me the privilege of following all of you into 2011 as well. Your shared wisdom, love, support, gifts and talents, family traditions, happy and sad times told, understanding and support are so precious to me. 2010 certainly brought its challenges into focus and so too it showed kindness and miracles and blessings. Life is like that, huh? :-) My Mom literally coming back to life was our greatest joy and blessing - my eldest daughters distance my greatest heartache - and every possible wonder and sorrow in between these highs and lows have all been known. And here I am, writing to all of you today to say your presence in my life made the wonderful that much more wonderful and the sorrows more bearable. "thank you" and "Happy-healthy New Year to all of you"
And so it is that this most blessed season of hope, miracle, promise, love and joy - there is also sadness, sorrow, grief and loss. And I am not the bearer of such bad news nor is it my intention to dampen any spirit - I am, however, acknowledging that amidst the 'fa-la-la-la-la's there are tears. As you all know - my eldest daughter is estranged from us and it hurts my heart so. I sent her a card with family pictures and also gifts for the children. She called.................and I could hear her speak - she said all the right things - the 'thank you's", and the "I love you's and updates on the baby. Her voice? It was an echo, across a vast canyon - I could not get hold of the origin or the place and space from where her words came - I could hear her - but the echo was in the distance - so far- so lost in the space of time and distance - I ached beyond expression. 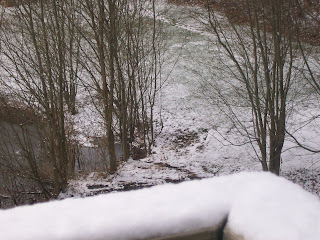 I awoke to a lovely gentle snow this morning - so soft and pretty to watch. I stepped out on to our upper deck and breathed deeply as cold snow flakes fell on to my hair and face....each flake like a promise of new hope. 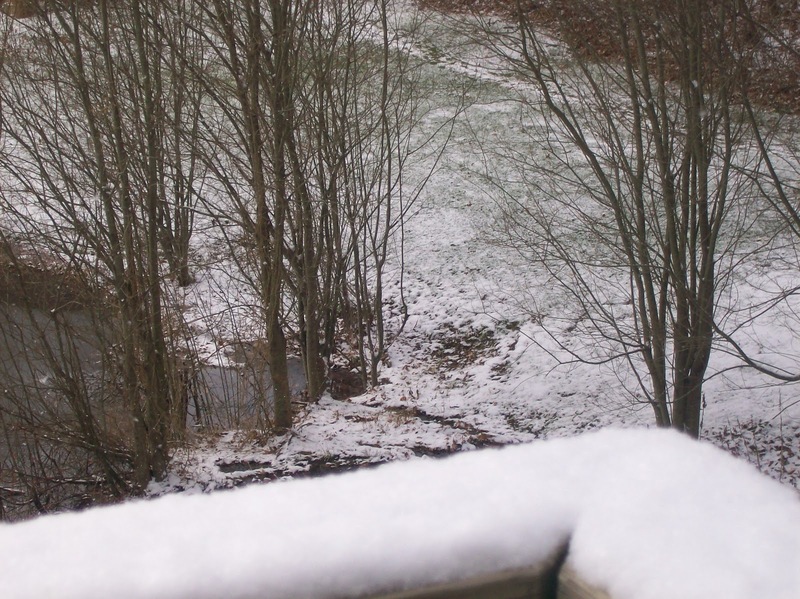 I was so excited to wake Skipp - "honey, it's snowed -, it's still snowing - everything is white!" He joined me on the deck - we stood silently in each others arms as the softest flakes landed on us so gently and quietly - I/we felt SO alive. I especially love the reflection of the tree in the pond out front. 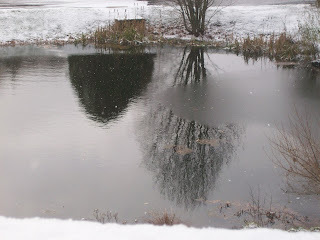 I love the first snow - each year it's beauty and meaning magnify as I realize how precious and fragile life is. 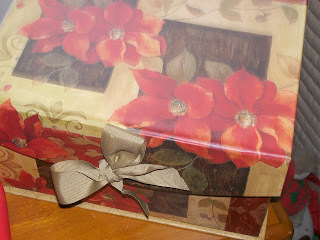 My wonderful sister-in-law spent the afternoon with me yesterday - she wrapped ALL our Christmas gifts. She is an artist and so detailed. She did a beautiful job. I am so blessed to have people in my life like Sherri so willing to help - wanting to help - I am humbled by her gracious giving of her time and talents to me. She asked me a question about my "Thanksgiving' letters and why I did not post my daughter Jennifer's. I explained that only those who sit at our Thanksgiving table get a letter - however, I did write one for Jennifer, as well. :-) And thank you Sherri for reminding me and I am thrilled to post it below. First and foremost is how you make me laugh, mostly at myself as a result of your quick with and never let anything slide approach, from a BIV to having MS - you have a way of easing the moment by getting me to laugh. “Thank you’. I truly love that you live close by - that we share in one anther's daily lives and help one another without being invasive. I feel so good when you stop by with Joel and Zak or alone - it is always fun and loving. I know you understand my loss over your Sister and the choices she has made - and I know you have tried to stand up for me and that means a lot. Some things are just not resolvable. Now, about "hope-the tree". Oh my goodness - she is dieing not much left to her. Sherri gave me a beautiful ornament for Hope - a jeweled peace sign, so sparkly and lovely - and we hung it proudly on our Christmas tree. I knew that Hope-the tree was barely hanging on for some time now and I was SO afraid to even say the words that "hope is dieing". My goodness. I now have a gorgeous "Hope-box", box of hope - all of the items folks have sent for Hope-the tree are now safely in the "Hope-Box". So HOPE IS ALIVE in the "Hope-Box"
So as you can see HOPE is alive with all of the hope folks have sent me now filling the new "Box of Hope"!! 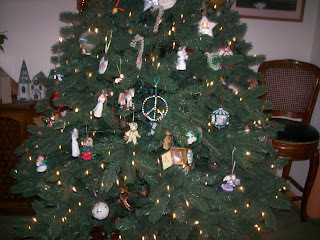 It was really hard to take the items off of Hope-The-Tree and place them in their new setting - but it is done. Hope never dies - it may change its setting but it NEVER dies. 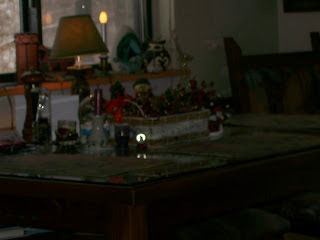 Below is a picture of our manger and our tree and our dining room table. The manger is the same manger I grew up with. The animals and Joseph, Mary and Jesus and the Wise Men were my grandmother's- they are almost 100 years old. 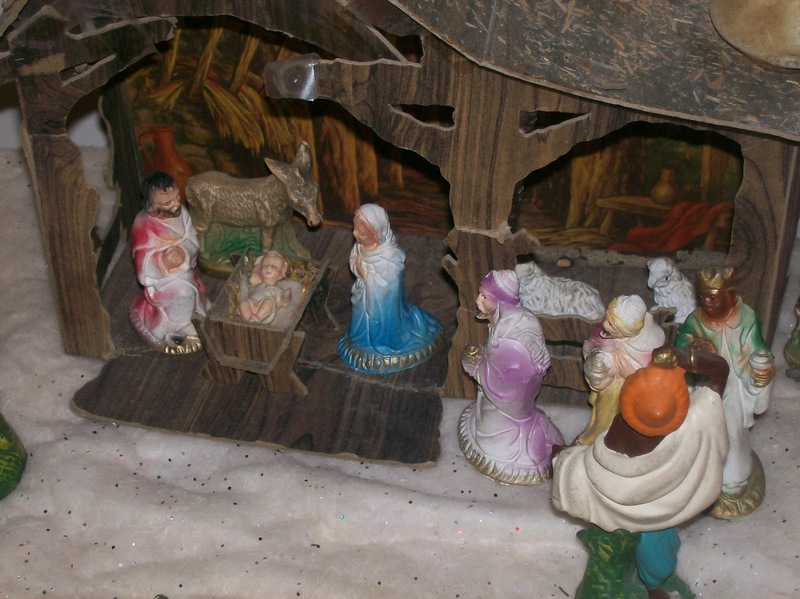 I am so honored to have this manger to display each year. 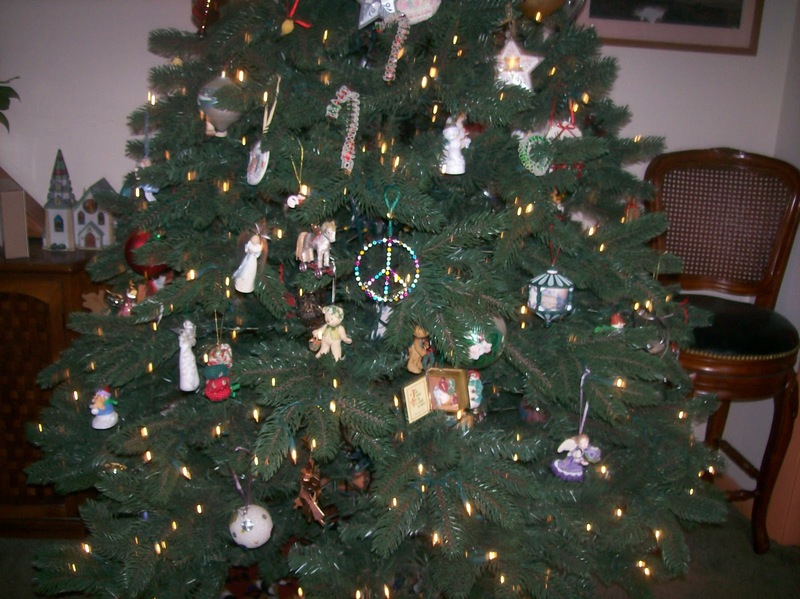 Look closely at the tree and you can see the beautiful jeweled 'peace/hope ornament Sherri gave us. Also, all of our ornaments are 'collector-series'. Skipp has been buying me ornaments for almost 20 years. Each one, each set is so meaningful, about love and family and hope. And also I have ornaments my Dad made right before he died and ones my kids made when they were little. 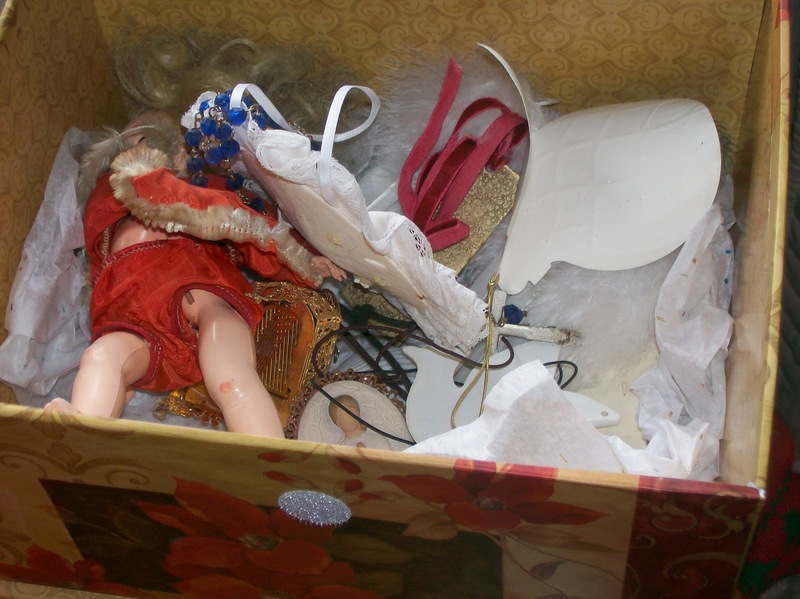 It was hard when I hung Kristie's on the tree- she was seven when she made it and we were so close. Oh how I miss my little girl. :-( Please continue to pray that her heart will open and she will see and feel the love and light of her family, once again.